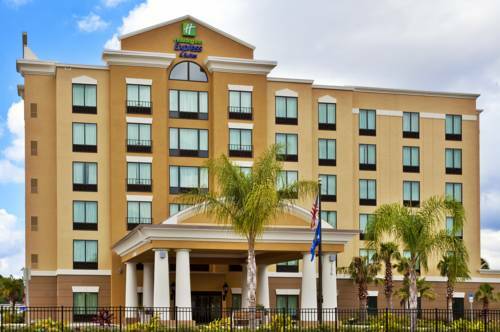 Stay in the heart of International Drive in OrlandoDo what's right for you and your wallet by booking reservations at this Holiday Inn Express� hotel. Our spacious, welcoming facilities make you feel like you never left home. Allow our hotel's location on International Drive in Orlando to place you right at the center of the action. Guests always enjoy stress-free travel in Orlando with our hotel's free limited shuttle service to Universal Studios�.Families looking for an affordable hotel on International Drive in Orlando, no longer have to sacrifice quality amenities for an affordable price. When you Stay Smart with us, you worry less and play more. For easy travel with the kids, take advantage of our free limited shuttle service to Universal Studios� and Disney's Magic Kingdom�. When you're done playing, we'll be there to take you back to the hotel.We are the place to stay if you need a hotel near Orange County Convention Center. Additionally, if you're looking to host an event, meeting or banquet, we boast over 2,000 sq ft of well-appointed meeting space. Guests can stay connected in all of our rooms with free high-speed, wireless Internet access.No matter how you spend your day in Orlando, the crystal clear waters of our outdoor pool and whirlpool can help you relax at the end of the day. Guests can even keep up with their daily routine in our state-of-the-art fitness center. Make reservations with us today! The world renowned Bay Hill golf course is just minutes away. Relax and enjoy a round of golf, or come to watch the local golf tournaments.